These mindfulness meditation techniques will help you to quiet your mind, release painful thoughts and emotions, connect with your divine inner awareness, feel more peace and love in your life, and experience your Oneness with All That Is. Twenty two years ago, DavidPaul and Candace Doyle received from Spirit the simplest, most powerful healing meditation techniques they've ever learned. They have since taught these life-changing meditation techniques to thousands of people around the world. Whether highly experienced with meditation or just a beginner, people's reactions are always the same ... "it's one of the simplest, most profound mindfulness meditation practices they've ever learned." 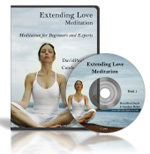 Unlike other mindfulness meditation techniques which require you to control your thinking, focus your attention on certain sounds, thoughts, or images, or attempt to stop your thinking altogether, this mindfulness meditation practice known as "extending love" will teach you how to relate to everything you become aware of in a way that allows your thinking to gently dissolve within you, guiding you ever deeper into the awareness of your True Self. Unfortunately, many meditation techniques out there simply instill bad "inner habits" that perpetuate the ego, fostering subtle self judgment, control, and denial. These mindfulness meditation techniques, on the other hand, will help you create positive, healing, and transformative ways of relating to both your inner and outer world. Whether you are just learning how to meditate or have been meditating for years, these mindfulness meditation techniques for beginners AND experts will radically deepen your meditation practice and strengthen your ability to stay connected and mindful throughout your day. What's more, this healing meditation practice can be used under any circumstances. Whether you're at work, driving down the road, having a conversation with a friend, or meditating with your eyes closed, it will quickly restore you to clarity, inner peace, and connection. Because these unique mindfulness meditation methods can be used in every area of your life, once you learn how to "extend love" using the meditation techniques we teach, your life will become a "living meditation." You will have the ability to deeply connect with all things without judgment—everything within yourself and everything and everyone in the world—filled only with a sense of peace, love, understanding, and acceptance in your heart and mind. These mindfulness meditation techniques will guide you into the quiet place within you where you are truly connected with God/Source. Once there, you will be in a position to access the infinite wisdom, understanding, and guidance that awaits you in the depths of your Being. "When I follow your healing meditation techniques, the practice brings me very shortly into a quiet place within myself. My body feels relaxed and I feel very connected to everything that exists. I have a real life experience that love does not come from the outside world but from deep inside of me. This is very empowering and makes me feel much more independent from external circumstances. If you read or listen to any of our books or audio/video products, practice all of the exercises, and your life is NOT impacted in a significant way, contact The Voice for Love at 541-488-0426 within 30 days to request a Full Product Refund.